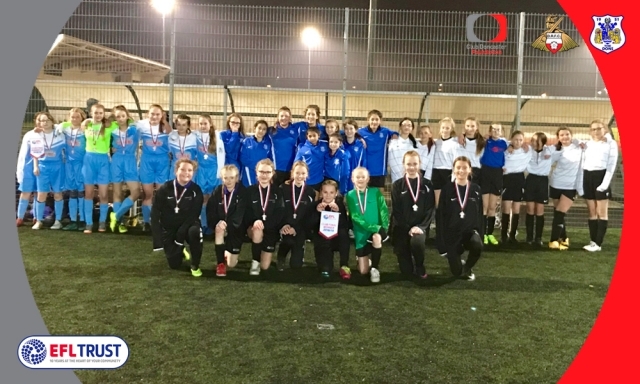 Forty-two secondary school girls from across the Doncaster region took part in the EFL Girls Cup on Wednesday night, with Rossington All Saints Academy going on to represent Doncaster Rovers at the area final after winning the tournament. The six-a-side tournament, which took place at the Keepmoat Stadium, was made up of six secondary school teams from: Hall Cross Academy; Balby Carr (Astrea Academy Woodfields); De Warenne Academy; Selby High School; Outwood Academy Danum and Rossington All Saints Academy. The teams competed in a mini league, facing each team once, with the winner of the league advancing through to the area final. The girls, made up of year seven and eight students from their respective schools, were proud to represent their school at the tournament, and enjoyed the experience throughout. Rossington won all but one of their games on their way to finishing top of the league, with only an entertaining draw against Selby High School stopping them from gaining maximum points. A plus 40-goal difference and two goals conceded throughout the tournament was an exceptional achievement, making Rossington deserved winners on the night. All Saints Academy PE teacher Katherine Fewster was delighted with how the girls played at the tournament. She said: “The girls had been excited all week to take part and they played so well. We are all looking forward to the next part of the event. Rossington will now go on to represent Rovers in the area final, which will be held at Nottingham Forest at the start of 2019. The winner of the area final will then move on to the regional final, with the winner advancing through to the grand final held at Wembley Stadium in March 2019. A six-a-side contest, the road to the finals began when the new school term started back in September. Each of the 72 EFL clubs organised a local competition for all schools wishing to take part in their area. More than 6,000 girls are involved in the competition each year, as the EFL Trust look to continue to build on the growing support of the women’s game.